The Moosehead Lake area of Maine abounds with freshwater delights – great fishing, colossal boating and scenic wonders that, until you contact a recommended Realtor, you can only dream about. The great outdoors of Baxter State Park just beyond Millinocket and Bangor offers over 200,000 acres with 46 mountain peaks, the highest being Mount Katahdin at over 5,000 feet. There are more than 175 miles of hiking trails and ten campgrounds in a park of massive grandeur. Live around the twin city region of Bangor and Brewer. Bangor area amenities include an International Airport, access to I-95, more than 3,000 lodgings, and a bevy of retail stores and boutiques in both Bangor’s downtown and the Bangor Mall area. Ask us about Maine Realty or share Maine real estate comments. To feature your Maine real estate listings or real estate agency, contact us. 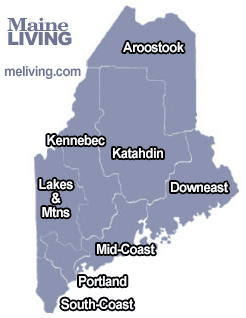 Discover Maine Real Estate in every region. Aroostook, Downeast, Katahdin, Kennebec, Lakes, Mid-Coast, Portland and South-Coast.